In this third book in the Nathan Fox series, England is facing the might of the Spanish Armada, which is gathering in Portugal, ready to invade. But first, Nathan, his sister Marie, and John Pearce, must go to Ireland on a secret mission which involves pirates, sorcery and decoding a list of Spanish spies. Then they must join Sir Francis Drake to do battle against the feared Armada. Woo! Hoo! 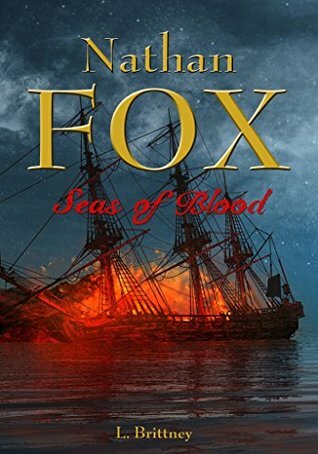 It has been a few years, but finally, another Nathan Fox book has been released.Book three,SEAS OF BLOOD, is perfectly summed up by the main character, Nathan Fox, himself: “A mad magician; a secret code book; Ireland and pirates – who could want for more?” who indeed? Certainly not me!!! The previous books in the series were Nathan Fox: Dangerous Times and Nathan Fox: Traitors Gold both of which I read and loved. In fact the first book was shortlisted for several UK publishing awards, including the Waterstone’s Children’s Book Prize and the Brandford Boase Award which is presented each year to an outstanding children’s or young-adult novel by a first-time writer. SEAS OF BLOOD is just as good. Set in Elizabethan days, fifteen-year-old actor, Nathan Fox, was working with no less that William Shakespeare himself, when he was recruited by Her Majesty’s Spymaster General, Sir Francis Walsingham. Along with his sister, Marie, Nathan is training to be a spy and being mentored by John Pearce. The whole of England is on edge and preparing for the imminent invasion of the Spanish king – who has a few reasons for wanting to take control. Queen Elizabeth is determined to thwart him in any way she can. There is a code which will reveal all the Spanish agents that have infiltrated the English Court, however there is a snag to accessing the code. The man who devised the code has lost his mind after becoming too deeply involved in alchemy and sorcery. He has been rescued and brought back to England where they hope he can be brought to his senses and the coded contents of his book revealed. In order to keep the enemy from finding him John, Nathan and Marie take him by boat to a remote part of Ireland where the pirate O’Malley will hopefully agree protect him in exchange for a royal pardon. To Nathan’s surprise Pirate O’Malley is a woman. Author Lynne Brittney has an absolute talent for blending real historical figures with her fictional characters in her books. In SEAS OF BLOOD the characters of Sir Francis Drake, Francis Walsingham, and Grace O’Malley are all real people. Grace O’Malley was one of Irelands most famous legends she was known as the Queen of the pirates and her people lived well under her rule, she was ruthless but fair. England did not treat her as fairly, she escaped them twice before they had a chance to put her to death. Life in Tudor England is explained vividly, and the scenes come alive on the pages. The absolutely deplorable conditions the English sailors had to fight in aboard their ships is horrendous. But compared to those of the Spanish sailors they were much better off. Sir Francis Drake was a bit of a bad boy – I found that I didn’t admire him quite as much as my school day History lessons would had led me to believe. The outcome of the Armada is a well-known fact, so what makes SEAS OF BLOOD so good is the meticulous research that Lynne Brittney has done to recreate a glimpse of the world it was set in. I was surprised by how few sailors could swim, but a lot of them were pressed into service, so the ability to swim is not one that a street urchin would have come with. While Nathan is a teen and the book is marketed at the YA market – it is certainly suited for people of all ages – and not just boys! Fast-paced action, heart in mouth moments along with some lighter moments – such as when Nathan learns to swim, and when he is befriended by one of Grace’s Irish Wolfhounds. Rating: Great – I really enjoyed reading it and it is a book I will be recommending to all my friends who like this genre. With thanks the author for my copy to read and review.